Bananas are one of the fruits I always have in the house. We seem to go through an awful lot of them whether it’s cooking porridge in the morning, eating one as a snack or using them for making bread; they rarely have time to go over-ripe but even if they do there are so many recipes you can use them in. Occasionally, I will quickly fry some for dessert. They take no time at all to cook and will keep in a warm oven (covered) whilst the main course is eaten. Cut bananas into two or three pieces, depending on size. Heat butter or oil in a fry pan and add honey or coconut sugar, cinnamon and bananas. Fry gently for a few minutes, shaking the pan so the bananas keep rolling over and cooking on all sides. You will find that the sugar and butter/oil will caramalize and become sticky. 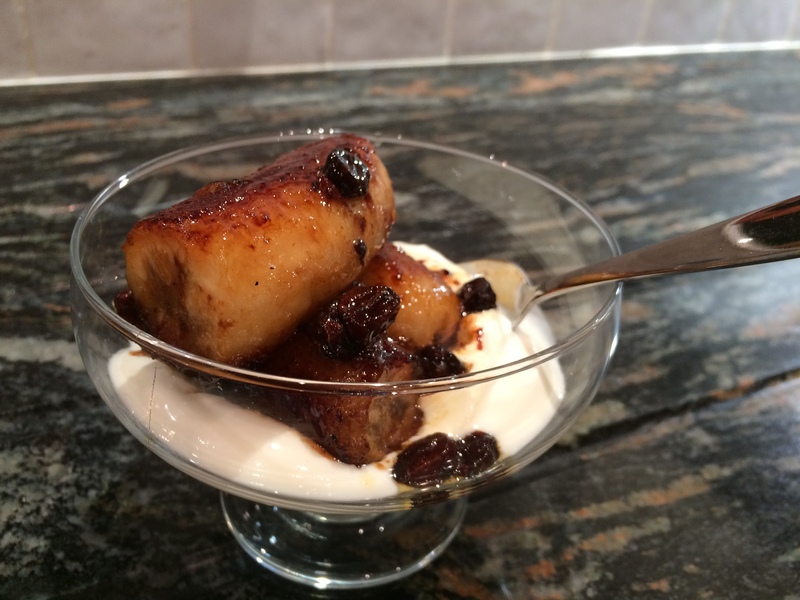 Add a splash of brandy and the raisins stirring carefully so as not to break the bananas. Put a couple of spoonfuls of live yoghurt into the bottom of a dish and pile the bananas on top. Drizzle with the sauce from the pan. Enjoy. This entry was posted in Sweets and Treats, Vegetarian and tagged Banana, Gluten Free, Healthy Eating, Probiotic Yoghurt, Vegetarian. Bookmark the permalink.